Social learners’ fitness depends on the number of other social learners in the population, because fewer social learners means more individual learners from which to copy up-to-date information. This results in Rogers’ paradox: When an ESS (dashed line) is reached, the population’s mean fitness is no higher than if the population consisted of individual learners alone. Rogers (1988) considered a population of individual learners tracking a temporally varying environment. Because social learners acquire information cheaper than individual learners, they are selected for when introduced. However, this eventually results in there being too few individual learners tracking the environment for up-to-date information to spread. Consequently, social learners’ fitness declines until an evolutionary stable state (ESS) is reached, with the population becoming a mix of both types of learners. Rogers’ key observation was that, by the definition of an ESS, social learners’ fitness at this stage must equal that of individual learners. In other words, while lower costs gave social learners an initial fitness advantage that allowed them to invade, social learning does not necessarily increase the population’s mean fitness in the long run. These results contradict both the assumption that social learning improves population fitness by reducing costs and, more broadly, that adaptiveness is an inevitable consequence of evolution. This finding was considered so striking that it came to be known as Rogers’ paradox. Where the payoff for Alice is b – c if Alice learns individually (regardless of what Bob does), b if Alice learns socially while Bob learns individually, and 0 if Alice and Bob both learn socially. This places the game on the border between the Hawk-Dove and Leadership games. From this formulation, we can see that the optimal scenario is to learn socially while your partner learns individually. The risk, of course, is that you both try this strategy, ending up with nothing. This means that, so long as b > 2c, individual learning is risk dominant over social learning, despite social learning offering a higher potential payoff. So, does social learning actually fail to raise population fitness? On a visit to McGill, Jeff Galef jokingly told me that he had never paid much attention to Rogers’ paradox simply because it was obviously wrong. Of course, all models are wrong and that is precisely what makes them useful. Rogers himself stressed that his model was a heuristic one: Its goal was not to argue that social learning fails to raise mean fitness, but to show that factors not included in his model must make up the difference. Consequently, numerous attempts have been made to resolve Rogers’ paradox by extending his model to consider factors other than cost. Rogers’ paradox has proven surprisingly robust against many of these extensions. For instance, using an island migration model, Boyd and Richerson (1995) showed that allowing the environment to vary spatially, rather than just temporally, fails to resolve the paradox. Rendell et al. (2010) also introduced spatial factors, but did so by constraining learning and dispersal to Moore neighborhoods. They found that Rogers’ paradox not only continues to apply, but is exaggerated: Mean fitness actually drops below the baseline of individual learning, because social learners reliably outcompete individual learners locally, suppressing their own most valuable source of data. Another extension proposed by Rogers (1988) was to consider the role of favorable learning biases, such as a preference for copying high fitness individuals or making the type of learning used contingent on the quality of environmental information. These are examples of what Laland (2004) has termed social learning strategies (“who” and “when” strategies, respectively). Boyd and Richerson (1995) found that adopting a “who” strategy of preferentially copying individual learners fails to resolve the paradox, because it does not dodge the problem of social learning being frequency dependent. Similarly, Kameda and Nakanishi (2002) showed in both modeling and experimental work that Rogers’ paradox severely restricts the utility of conformity bias (a “who” strategy of preferentially copying the majority). Nevertheless, “when” strategies can successfully resolve Rogers’ paradox. These are contextual rules that determine when to switch between individual and social learning, allowing individual learning to apply more selectively. For instance, if an individual learns on their own when individual learning is more accurate or less costly, but switches to social learning when this ceases to be the case, then the resulting population’s mean fitness can rise above baseline (Boyd & Richerson, 1995). Both modeling and experimental work has shown that this solution applies across a broad range of parameters (Kameda & Nakanishi, 2003). Enquist et al. (2007) proposed two other “when” strategies that also resolve Rogers’ paradox: the “critical social learner” and “conditional social learner.” The critical social learner attempts to learn socially, but switches to individual learning when unsuccessful. 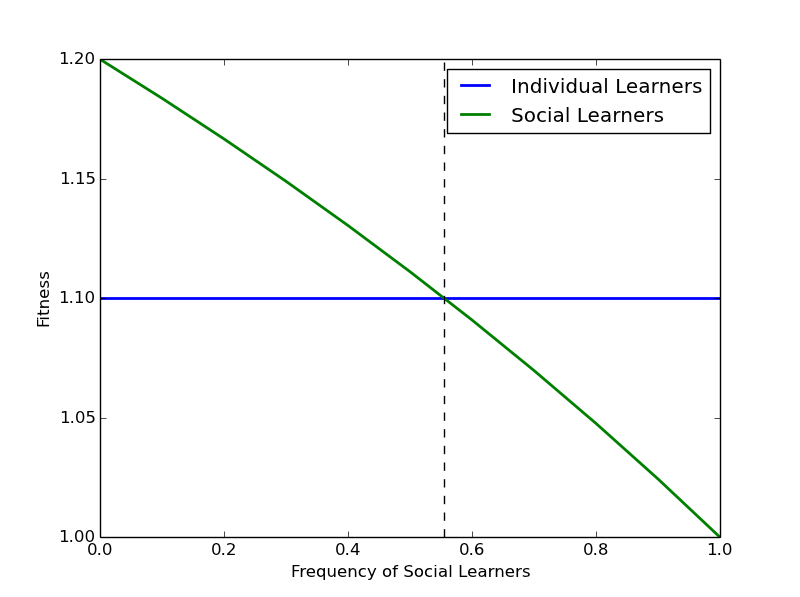 Conversely, the conditional social learner attempts to learn individually, but switches to social learning when this fails. They showed that critical social learning generally raises mean fitness and is selected for by evolution, except when social learning is highly unfaithful, the environment is highly variable or social learning is much more costly than individual learning. They further showed that conditional social learning is only selected for if individual learning is quite cheap, whereas pure individual learning is only selected for if the environment is extremely unstable or transmission fidelity approaches zero. In short, the critical social learning strategy resolves Rogers’ paradox under the broadest range of conditions. Rendell et al. (2010) further extended these results, showing that, because spatially varying environments make social learning less effective, they broadly favor conditional over critical social learning. In fact, if the cost of individual learning is sufficiently low, then this effect may be potent enough for conditional social learning to be selected for over critical social learning. In such cases, the conditional strategy may also be selected for over pure individual learning, but only if individual learning is unreliable, making social information a useful backup source of data. Finally, by considering environmental harshness (the degree to which incorrect solutions are punished), Rendell et al. showed that greater harshness generally favors the critical social learner, while lesser harshness favors the conditional one. This is broadly consistent with the view that austerity often drives reliance on others. In addition to “when” strategies, another factor that can resolve Rogers’ paradox is what happens when knowledge can accumulate over time. Boyd and Richerson (1995) showed that, if incremental learning in small steps is less costly than learning in large steps, then Rogers’ paradox ceases to apply. That is to say, the mere presence of social learners who can accumulate knowledge over time can result in higher mean fitness, so long as small steps are less costly. Ehn and Laland (2012) considered this issue in greater detail, showing that if this assumption about costs does not hold, then Rogers’ paradox can be replicated in a cumulative setting. However, they also showed that both the critical and conditional social learning strategies can resolve the paradox in this context. Moreover, they showed that an “individual refiner” strategy that learns socially, but attempts to refine its solution through individual learning regardless of success or failure, can also raise population fitness. To sum up, theoretical work has shown that the evolution of social learning is much more subtle question than a mere advantage in costs. On the contrary, Rogers’ paradox has proven surprisingly difficult to resolve. For instance, simply complicating a model with spatial factors not only fails to resolve the paradox, but can in fact exacerbate it. Furthermore, some social learning strategies (“who” strategies) that even Rogers anticipated might resolve the paradox generally fail to do so. Nevertheless, strategies that govern when an individual switches between social and individual learning (“when” strategies) have met with greater success. In particular, Enquist et al. (2007)’s critical and conditional social learning strategies have been well explored, and have even been found to raise mean fitness in settings where learning is cumulative (Ehn & Laland, 2012). Though Rogers’ initial model is sometimes seen as a mere curiosity, it has nevertheless contributed substantially to our understanding of social learning. Aoki, K., Wakano, J. Y., & Feldman, M. W. (2005). The emergence of social learning in a temporally changing environment: A theoretical model. Current Anthropology, 46(2), 334-340. Kameda, T., & Nakanishi, D. (2002). Cost-benefit analysis of social/cultural learning in a nonstationary uncertain environment: an evolutionary simulation and an experiment with human subjects. Evolution and Human Behavior, 23, 373-393. Laland, K. N. (2004). Social learning strategies. Learn Behav, 32(1), 4-14. So when I read this blogpost, am I then the information scrounger, the lowly parasite? This depends on a couple of factors, most prominent among which is if you consider Marcel to be part of your social sphere and what the information in question is. If you consider Marcel as part of your social circles and the relevant information as “Rogers’ paradox” then you are most likely engaging in social learning. In fact, under such a view, most book reading would also be social learning. If engage with the material actively, however, such as by raising and answering extra objection then you would be moving from social learning to individual learning. That is why ‘book-smarts’ or ‘rote-memorization’ can be viewed as social learning. On the other hand, if you consider Marcel as not part of your social circles or if the relevant information isn’t “Rogers’ paradox” but something more meta like “what are blogs worth reading?” then you could be engaged in individual learning. For example, if you took on the (sometimes painful and boring) task of reading this blog regularly and concluded that TheEGG is a blog worth reading then you have engaged in individual learning. An individual knowledge that you should share with all your friends ;). This blog isn’t too boring, nor painful. I’ll go ahead and share my individual learning with friends whilst I’m good and drunk. Great piece on the paradox I really learned alot. Please forgive me if I’m being redundant but has anyone considered what would happen if you played around with the fluidity of information among different populations. What do you mean by fluidity of information in this setting? The cost of social learning or the fidelity of the learning or something else?